An unique innovation platform to invigorate the sector of the rehabilitation and construction. Show your productos and innovations to the sector. A specialized environment where to find the latest products, materials, solutions and services. Take advantage of high-profile networking opportunities! We recognize innovation and disruption in advanced architecture. The latest innovations in materials for the construction, renovation and rehabilitation. New manufacturers and distributors in the sector. New solutions and construction technologies. Saving opportunities for energy efficiency. Ecological and sustainable products and materials. Technological and project management advances. The technical code for building and energy efficiency. Housing stock to reform and rehabilitate. REBUILD was born to provide you and help you identify all the solutions that will lead to increase your innovation and competitiveness on a daily basis. Also, the National Congress of Architecture 4.0 and Advanced Construction is a space to discover new materials, the latest emerging technologies and the most innovative construction systems. A must-attend event for any professional aiming to boost their activity to the highest level of competitiveness and innovation. How to design and build new spaces with virtual reality; the new technical building code; 3D and additive manufacturing applied to rehabilitation; IoT in building management; BIM, applications and cloud platforms; Energy Efficiency in Housing and Buildings or new profiles and professional training for a renewed sector, are some of the topics that will inspire our professionals. 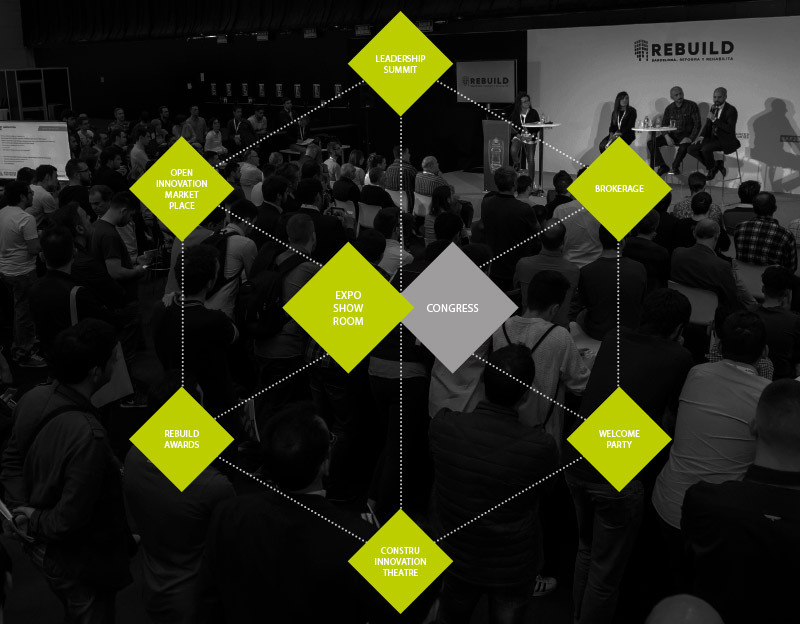 REBUILD gathers various events that make it a not-to-miss event for any businessman or professional of the construction sector, interior design and rehabilitation. For example, the Leadership Summit is a business lunch with industry leaders and stakeholders. The Open Innovation Marketplace brings together all technological centres and start-ups that bring new solutions to the world of rehabilitation and construction in general whereas the Brookerage Event is the meeting that brings manufacturers brands with new distributors and these with builders, large installers, rehabilitation companies and developers. REBUILD is designed for visitors to live a unique experience in the world of reform and rehabilitation. To this end, besides of devoting all our efforts to turn it into an authentic platform for business and technology transfer, the Constru Innovation Theatre gives the opportunity to share all the innovations of our exhibitors in a unique auditorium that will provide the leads of all attendees of your presentation. Our fun & business events, such as the Welcome Party or the Rebuild Awards, ensure a much more relaxed atmosphere which fosters business opportunities from another perspective.